No sticky carpets or popcorn crunching under foot, no unreasonably tall people sat directly in front of you, no sickly couples canoodling and talking over the film. No rustling crisp packets, no slurping drinks. Just your own fully-reclined seat in the front row, every single time – you can even pause the film to nip to the toilet. We've just described the Cardboard Home Cinema, and for the paltry cost of a couple of movie tickets this immersive cinematic experience can be yours. 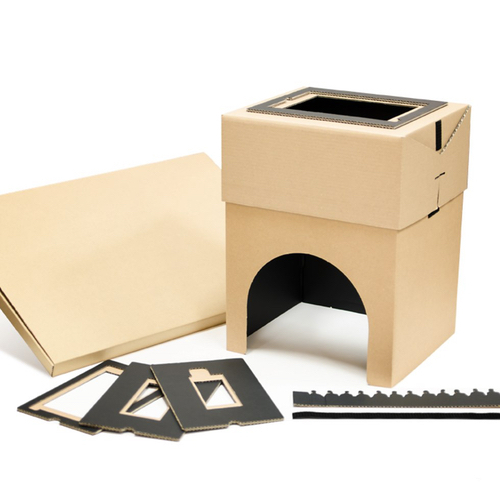 Made from super rugged cardboard, it arrives flat-packed and can be quickly assembled in a matter of minutes. Your smartphone/tablet sits atop the box and plays your movie of choice while you lay down beneath it. The height of the box is easily adjusted so that your eyes are a comfortable distance from the screen (e.g. lower for an iphone, higher for an iPad). The darkened interior of the box replicates the cinema experience with astounding accuracy and if you're looking for even greater authenticity, just slot in the cardboard audience silhouette and you'll feel right at home. Since the rise of Netflix, snooty critics have complained that smart devices are no way to properly enjoy a movie. We're inclined to disagree. Get yourself the Cardboard Home Cinema, lay back and enjoy.